If you’re in the market for a new bathroom vanity, you’ll need to make sure it’s the right size and style. Follow this guide to buy with confidence. A new vanity can instantly transform a boring or outdated bathroom into a space you can be proud of. But there are many things to consider besides appearance when you’re making your vanity selection. This article will walk you through what you need to know to make sure you choose a bathroom vanity that’s the perfect fit for your home. Perhaps the most important step to choosing the right bathroom vanity is determining what size you’ll need, and the size depends upon the amount of space you have available. If you’re replacing an existing vanity and plan to keep the size the same, you can simply measure the length and width of the vanity you already have. If you’re starting from scratch in an empty bathroom or plan to change the size of your vanity, get out your tape measure and measure the length and width of the potential vanity size you have in mind. It may be helpful to put down tape so you can step back and get a feel for what the size of your future vanity will do to the function and aesthetic of the room. 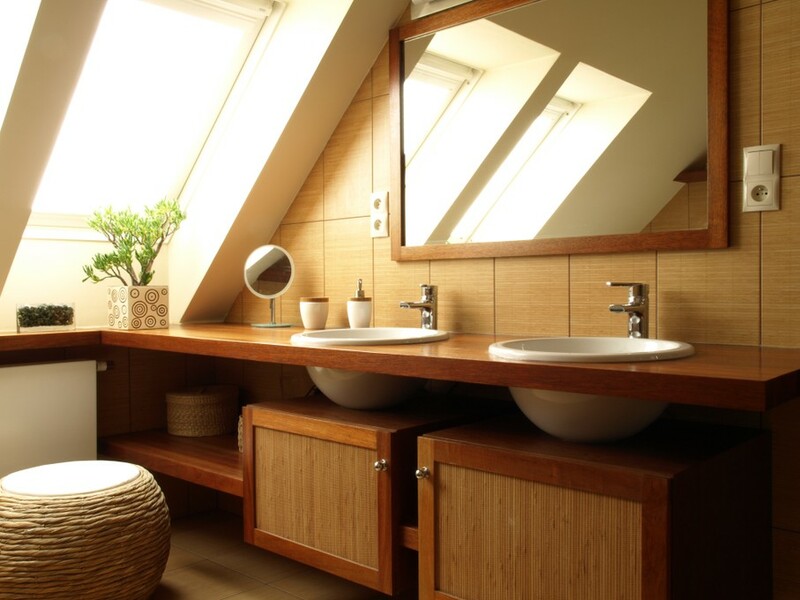 Keep in mind that if your vanity is located next to a toilet, you’ll want to leave enough room for comfortable access, and perhaps a wastebasket close by too. You’ll also want to make sure your vanity isn’t so wide that interferes with your ability to open and close the bathroom door or makes it difficult to step out of the tub or shower. Once you know what size vanity your bathroom can accommodate, you can move on to other considerations. Tip: If you’re replacing an existing vanity and want to select something smaller, keep in mind that this could potentially lead to other projects. Once the old vanity is removed, you may find that the flooring underneath has been damaged in the process, or that there’s no flooring underneath it at all, which means it’s possible your entire floor will need to be replaced. It’s also possible that removing the old vanity will cause damage to your paint or drywall, making it necessary to take on a project to do repairs or repaint. If you want to choose a smaller vanity but don’t want to take on any additional projects, remove your old vanity first and see what the situation is so there will be no surprises when you go to install your new vanity. You may have the option of installing a bathroom vanity with two sinks if your vanity is large enough. Keep in mind that opting for two sinks could mean hiring a plumber if your bathroom isn’t set up for two sinks already. Bathroom vanities with two sinks are popular options for shared bathrooms because they allow more than one person to perform tasks (such as brushing their teeth) simultaneously, and give each person an opportunity to claim their own space, regardless if they plan to use the bathroom at the same time or not. There are many types of bathroom sinks. Make sure to pick one you’ll love for a long time. Keep in mind, however, that choosing a vanity with two sinks means there will be less counter space, which is the next thing to consider. If you like to keep items like makeup, lotion, and hair products on top of your vanity, you’ll want to make sure you select one with sufficient counter space. This may also be a consideration if you plan to use your counters for particular décor items. If you need more counter space than your bathroom will easily accommodate, there are some vanities with a ledge that extends over the top of your toilet. If you’re considering this vanity style, just make sure it’s mounted high enough to allow you to remove the lid to your toilet tank if necessary. Even if you like to keep your personal care items on the countertop, there are other items you may want to keep elsewhere in your bathroom vanity cabinets. These are typically items such as cleaning supplies, extra toilet paper, personal hygiene products, medication, etc. If you don’t have a linen closet, you may even wish to store clean towels or washcloths. Think about what you’ll want to store inside your vanity to make sure there will be ample space in the vanity you choose. You should also consider how many of those items you wish to keep hidden from view. This will be an important factor in determining the number of cabinets you need and the style of vanity you prefer. Tip: Click here for more bathroom storage ideas. Vanities come in a variety of colors, materials, and styles. In most cases, you’ll want to pick one that complements the décor of the rest of your house, or at least the areas they’re closest to. Do you have modern and minimalist décor, or is your home filled with antiques? Do you want your vanity to blend in with the color of your floor or contrast with it? If you have at least a general idea of the color and style you prefer, you’re likely to save a great deal of time and be able focus your energy on appropriate pieces. That being said, keep an open mind because there may be an option you weren’t aware of. Look at least a couple of different pieces in other categories before you choose your bathroom vanity. If nothing else, it will reaffirm your instincts and allow you to reassure yourself that you’re on the right track.